We look forward to getting to know you and your child. Inquire here or click on the Inquire Online button to the right to get started. Or you may contact the Office of Admission directly at (203) 801-4833 or by email at admissions@stlukesct.org. We invite you to take a tour of our campus, meet our students and faculty, and learn more about our academic programs during one of our Admissions Events. For your convenience, St. Luke’s School exclusively accepts the Standard Application Online (SAO), which simplifies the application process by allowing you to apply to multiple schools using a single application. SAO is also used by many of our peer schools and boarding schools. To begin your application, please visit the SAO website and create an account or sign in to complete the Student Profile. St. Luke’s code is 6530. Please select the application that applies to your student's entering grade. St. Luke's offers separate SAO application forms for grade 5, grade 6, grades 7/8, and grades 9-11. Upon St. Luke's receipt of the Student Profile and a non-refundable fee of $75, we will invite you to campus for a day visit, campus tour, and interview with a member of the Admissions team. For for more information about the Standard Application Online, please visit the Standard Application Online (SAO) FAQs. The deadline for the student profile is November 30. Recommendations (English, Math, and Extracurricular) submitted via the Standard Application Online (SAO) or the Fairchester Common Recommendation Form. We understand that some schools are no longer writing recommendations. If you have any questions about this, please contact the Office of Admission. Student Day Visit: Applicants will spend a day attending classes with a St. Luke's student. A member of our admissions team will interview applicants at the end of the day. Parent Meeting: Parents of applicants will come to campus for a student-led tour followed by an interview with a member of our admissions team. Parent and Student Meetings: Applicants and their parents will come to campus for a student-led tour and individual interviews with a member of our admissions team. Student Day Visit (optional): After completion of the Parent and Student Meetings, applicants may spend a day attending classes with a St. Luke's student. Applicants are required to submit standardized test scores from the ISEE, SSAT, or PSAT from the current year. The ISEE is administered several times each year at St. Luke’s: November 17, 2018, December 1, 2018, January 12, 2019, and April 13, 2019. To learn more about the ISEE or to register, please visit the ISEE website. Families who apply to St. Luke's and are requesting Tuition Assistance must complete their Parents' Financial Statement and submit all other required documents by December 31. Click here for more information about St. Luke's Tuition Assistance Program. Applicants request viewbooks and application materials for the coming school year. Appointments and school visits will be scheduled once the Student Profile and $75 non-refundable fee are received by the Office of Admission. Families should plan to visit St. Luke's School by attending our Fall Open House or one of our Welcome Wednesdays. Please note that the application process takes several weeks to complete. In order to meet application deadlines, recommendations and transcripts should be given to your school as soon as possible. Parent and student visits must be scheduled at least one week in advance. Students should also plan to take the necessary admission testing no later than January 15. November 30: Student Profile due. December 31: Parents' Financial Statements (PFS) for all returning and prospective families applying for Tuition Assistance are due to School and Student Services (SSS). January 15: The Student and Parent Statements, as well as the student writing sample, standardized test results, two years of school records, and all recommendations (English, Math and Extracurricular) must be received by the Office of Admission. February: Applicants who have completed the admissions process by January 15 will receive decision notifications by mid-February. March: Students admitted in February are asked to notify the Office of Admission of their decisions by March 6, 2019. 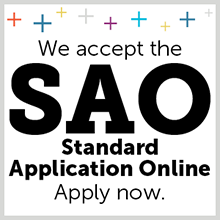 St. Luke's School accepts the Standard Application Online (SAO). To learn more about using the SAO and begin your application, click here. St. Luke's Code is 6530.